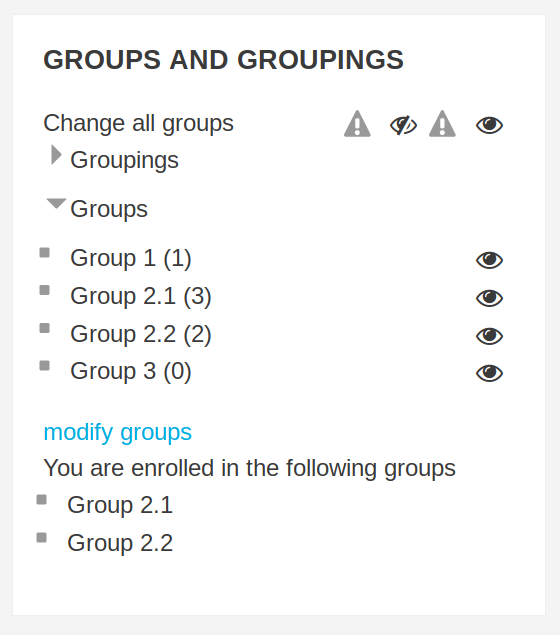 A Moodle block to display groups and groupings to users. The plugin differentiates between the capability rights of users to evaluate the appropriate amount of information to be displayed. In initial state value groups and groupings are not listed. In case the required change is not possible a warning message is displayed and the affected group is marked with a triangle. 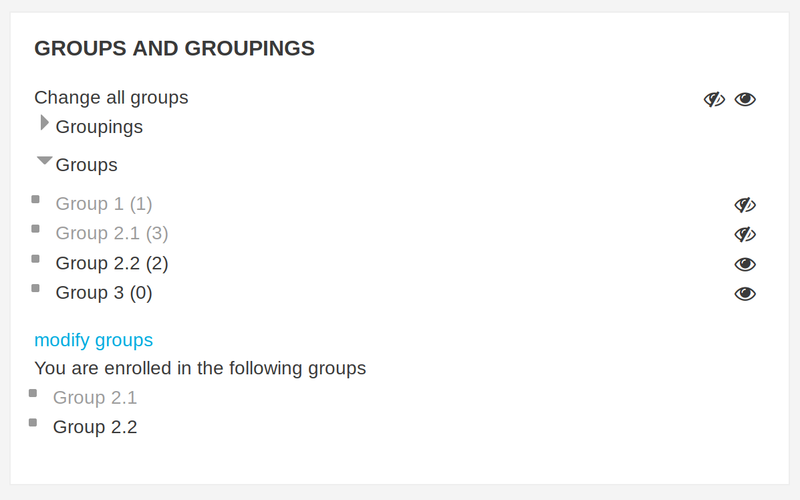 In the current state of the block groupings are not displayed to the students. 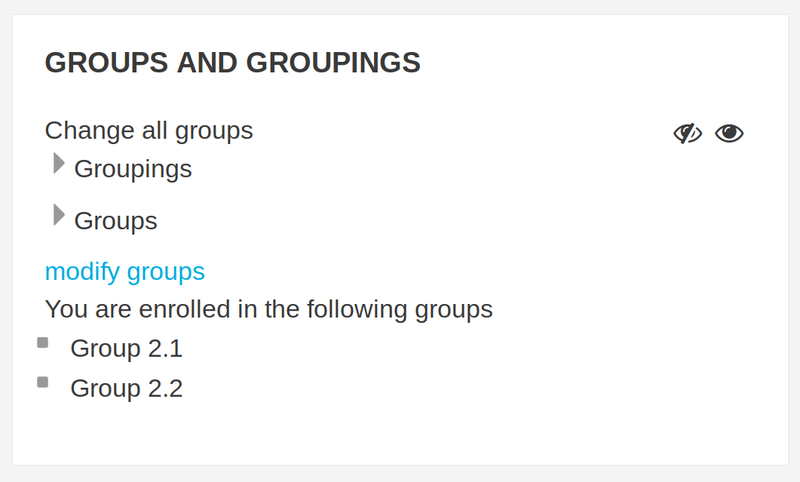 Students are only able to view the groups they are enrolled in. 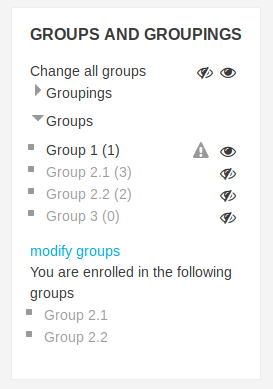 In case they are not enrolled in any visible group, no block is displayed. I am happy to approve this now. You are cleared to land, welcome to the Plugins directory! I really like your plugin and install it to the Moodle system in my institution. However, when clicking to unhide a group in the ‘groups and grouping’ block, there is always a error message, saying "the required change is not possible". But after I click "ok" button in the error message and refresh the Moodle page, the group is unbidden. We use Moodle 3.1. I really hope you could fix it. In addition, since it is common to have hundred students in a module and seperate them into groups. It is a lot of work to unhide the groups one by one. Is is possible to add a setting in the block about hide/unhide all groups, please? thank you for your feedback! Moodle 3.1 does control the Param different, therefore the warning message is thrown. The bug will be fixed soon in a new version. The new version should solve the error-message bug.